“All over the sky a sacred voice is calling your name.” Listen for that voice as we gather. We are here to align our collective conscience. We are here to pray for healing of the on-going devastation and genocide of a people in a sovereign nation on our northern border. We are here to pray for ourselves. As we come together today I would ask that we acknowledge and honor the spiritual fact that the people of the Oglala Lakota nation are God’s people, as are we. They are a gathering of precious souls—many of whom are broken by their particular vulnerability to addiction to alcohol. That vulnerability is one we have known and understood and exploited for centuries–even before the establishment of WC in 1904 when Roosevelt removed the 50 mile Alcohol Buffer Zone. We, as Nebraskans, are complicit in gathering the taxes yet turning a blind eye to the trauma and annihilation of a people wounded and abandoned beside us. We must pray for forgiveness and for blessings for the beloved people of PineRidge. We must bolster each other’s faith in order to fight for justice and to stand with those who are powerless and oppressed. My faith stands on 3 simple words: God is Love. For me, the phrase is it’s own simple palindrome because it reads the same forward and backward—God is Love. Love is God. Great spiritual power exudes from the knowledge that God is Love. I believe that if our society were perfected in Love, we would not stand by and watch the isolation, the trauma of the indigenous souls around us. If we were perfected in Love, we would not shrug our shoulders in indifference to the unemployment, poverty, disease, and lives of our brothers and sisters who are plagued by addictions that work to undermine a noble culture. If the faith that God is Love were the compass by which our society and lives were led and governed, we would have solved this issue long ago. We all need to pray to not become overwhelmed but determined in Love. 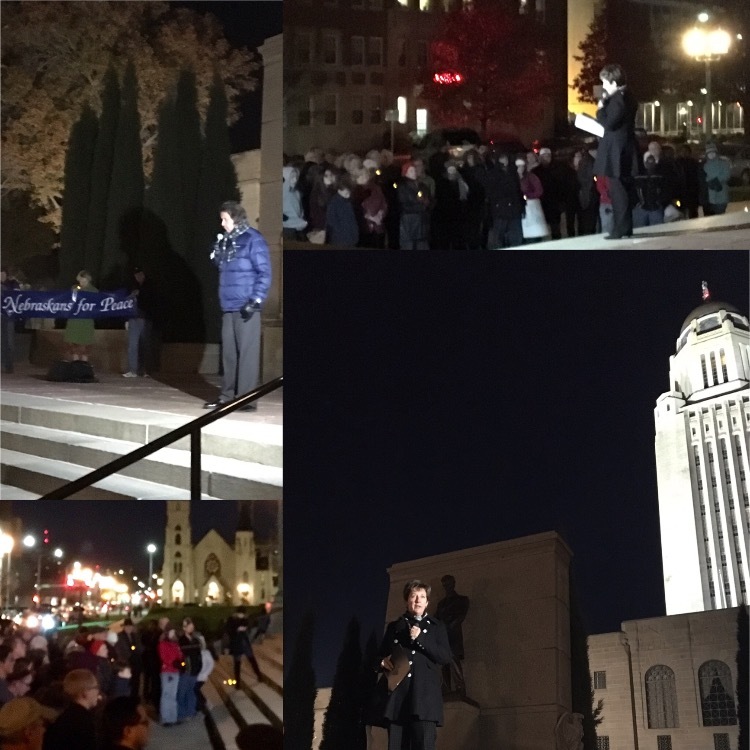 Determined to bring our gifts and talents, our LOVE, to work to heal an untenable, indefensible situation where people in Nebraska are preying on the particular vulnerabilities rather than praying for the victims. As Black Elk said: The first peace, which is the most important, is that which comes within the souls of people when they realize their relationship, their oneness with the universe and all its powers, and when they realize at the center of the universe dwells the Great Spirit, and that its center is really everywhere, it is within each of us. “Mitakuye Oyasin” (Mi-talk-u-ee O-ya-sin)—“we are all related.” Mitakuye Oyasin.